Three years ago, my buddy Jackson Tegu asked me to write a stretch goal for his Second Skins kickstarter. Based on two of those skins, the Wyrm and the Unicorn of course, I had an idea: combine Jackson’s ideas with Adventures on Dungeon Planet and make a campaign supplement for Dungeon World. 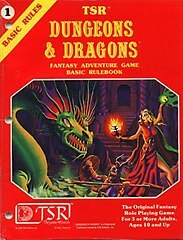 From the very beginning it was an overambitious rpg monstrosity, and then I decided to add one-shot rules. And now it’s finished. Space Wurm vs. Moonicorn is a science fantasy supplement for Dungeon World that combines the flavours of Adventures on Dungeon Planet and the characters from Jackson Tegu’s Monsterhearts expansion, the Second Skins, into 368 full colour digest-sized pages, with well over a hundred illustrations, including fantastic art by Chiara Di Francia, George Cotronis, Iolanda Zanfardino, Jakub Rebelka, James Fenner, Jon Cairns, Nate Marcel, and Taylor Winder. Space Wurm, the most important person in the galaxy, bar none. And yet, there is more that lies outside your power than within it. Will you conquer the universe, or see it fall before your foes? Moonicorn, a rebel and a revolutionary. Those who despise your integrity are out there hunting for you. Can you make your dreams a reality, or will you have to watch it all come crashing down? The Lover, the third point of a romantic triangle with Space Wurm and Moonicorn. Is this what true love is, or just a fleeting dream? The Mogul, a master of industry. You’re not the boss of everything, but you’re the boss of your thing. The Other, a visitor from far away. Can you find a place in this new world, or will you just lose your heart again? The Spy, a double agent, a saboteur, a wolf in sheep’s clothing. Does anyone knows where your true allegiance lies? Do you? …and seven fronts, with four dangers each, for the GM to create the world and their antagonists from: aliens, cybernetics, the Imperial throne, interstellar travel, religion, the secret police, and the spice. Each game has three fronts that must be defeated in order to win. 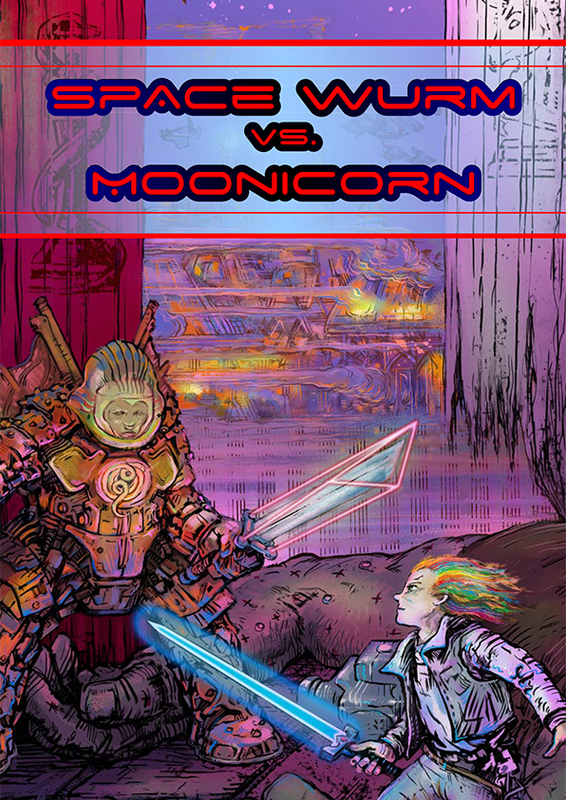 Who will reach their goal first and secure the future they are fighting for, Space Wurm or Moonicorn? 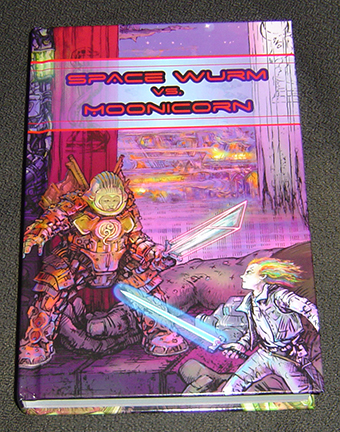 Space Wurm and Moonicorn are rivals, fighting over the future of galactic civilization. Will they let the universe crumble around them while they duke it out? Will they band together against the outside forces trying to ruin everything? Which one will betray the other first, in order to secure the future they believe in? The other PCs move between them, choosing sides or not, trying to mediate and reach consensus, or feeding the flames so they can watch it all burn. But neither Space Wurm nor Moonicorn can succeed alone. In order to win, they need the support of the other PCs. What will they do to win their loyalty? What—and who—will they sacrifice in order to come out on top? 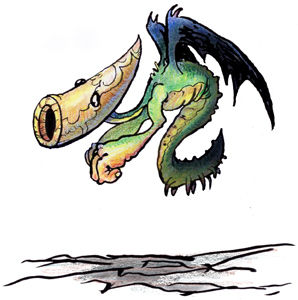 Space Wurm vs. Moonicorn moves Dungeon World away from typical adventuring parties and us-against-the-dungeon situations, in favour of more intrigue, more politics, and more interpersonal conflict between the PCs. You’ll need your laser swords to defeat the alien invaders, but you’ll need something more to win over their hearts and minds. Each of the new character classes are there to promote narratives of interpersonal drama, political intrigue, and social change. They give the players reasons to experience the shifting allegiances of competing rivals, to win each other over and then turn against each other, again and again. It’s still Dungeon World, just with an expanded pallette, and more dimensions to explore. If you can’t commit to a long-term campaign, fear not! There are quick play rules for running one shot games of Space Wurm vs. Moonicorn, in the same style as Battle Between the Worlds. Quick play versions of the six Dungeon World character classes are joined by seven more classes: the Alien Queen, the Creature from the Ghoul Star, This Planet’s Messiah, the Serpent Princess, Space Ghost, the Star Vampire, and the Void Rat. Or use the characters from Battle Between the Worlds, these rules are fully compatible. 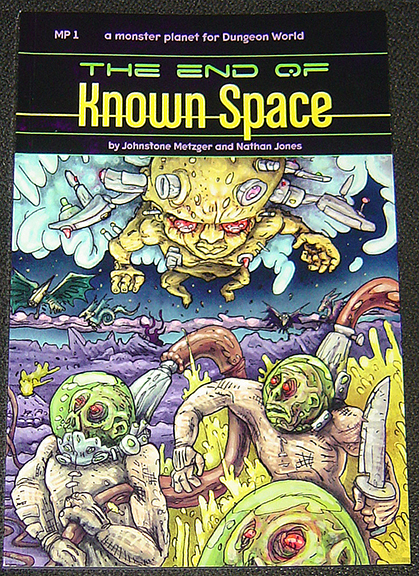 The print version is 6×9 US Trade size, for both hardcover and softcover. The PDF is 5.5×8.5 digest size, and includes character sheets and a version of the book with black text on white pages for ease of printing. 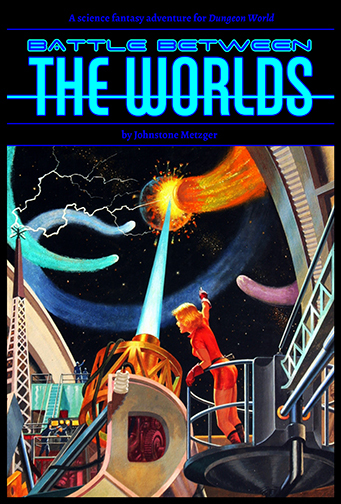 CLICK HERE to view a 53-page preview of the book, which includes the Table of Contents, the Space Wurm class, the introduction to the Interstellar Transport chapter and 2 of its dangers (Disease Control and Space Madness), as well as two dangers from other fronts chapters. Buy it from DriveThruRPG at this link right here. You can also buy a softcover version from Lulu, but because of their full-colour print costs, you will need a discount code to make it even close to price-competitive. Huge creatures that fly through both air and space, these cone-faced marauders were deposited upon the moon of Maldorine VII by aliens vast aeons ago. They lay in suspended animation until very recently, when they awoke and flew through the space between worlds to bring death and destruction to an infamously deadly planet. Special Qualities: Flying, Ray-Eater, Voidstalker. The moon marauders now roam the skies above Maldorine VII’s deathlands, soaking up the various ultra-spectrum radiations. 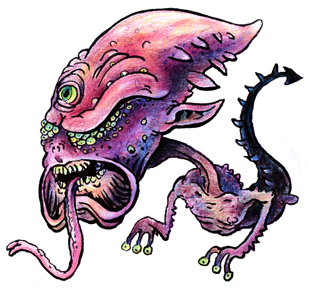 They produce waste in the form of a hyperplasmic liquid residue that they spew from the orifice on the front of their face. This residue is incredibly destructive to the planet, polluting the land and killing off the various terrifying megafauna and the flora they feed off of. Huge tracts of land are now smouldering wasteland, and certain forms of indigenous life have begun to turn against the marauders. Instinct: To absorb ultraspectrum energies. 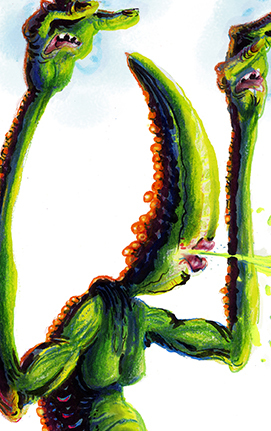 Grab a foe in gigantic hands. Take to the skies and fly through space. When they are resistant to hyperplasma: Throw them into the Killer Sea. When they block the ultraspectrum rays: Smash them! When they prove to be dangerous: Retreat into space or the caverns of Maldorine VII’s Dark Zone. I have added new print options at DriveThruRPG for some of my books. I have not really been happy with the B&W print option Lightning source offers, mainly because they don’t do full bleed and I use bleed on pretty much all of my books except the Metamorphica. Evil Wizards in a Cave now has a Standard Colour print option, although the book is still in black & white. It just has full bleed. The black inks aren’t quite as rich as either the B&W option or the Lulu version (which is still the best option, in my opinion), but it looks pretty decent, all in all. I’ve added the Standard Colour option to Adventures on Dungeon Planet, but left the B&W option available, for those of you who are discerning enough to care about the difference. B&W has richer blacks, but Standard Colour has full bleed instead of white space at the edge of the pages. If you don’t care either way, I make more money if you buy the B&W version (though not very much more). The B&W version of Lair of the Unknown still looks pretty good to me, even with that white space, so I haven’t tried to make a new pdf for a Standard Colour option for that books, although I am currently waiting to see what the Knives in the Dark Standard Colour option looks like, and I may switch that title over if it looks as good as Evil Wizards in a Cave. The Third Verse will have a Standard Colour print option available sometime next month.